In the first half he revelled in the large spaces that were opened up by Kilglass Gaels’ ability to move the ball from one end of the field to the other at pace. But as Clann na nGael started to turn the screw after half time, Ciarán McHugh knew that his team needed a momentum changer to get back on the front foot. 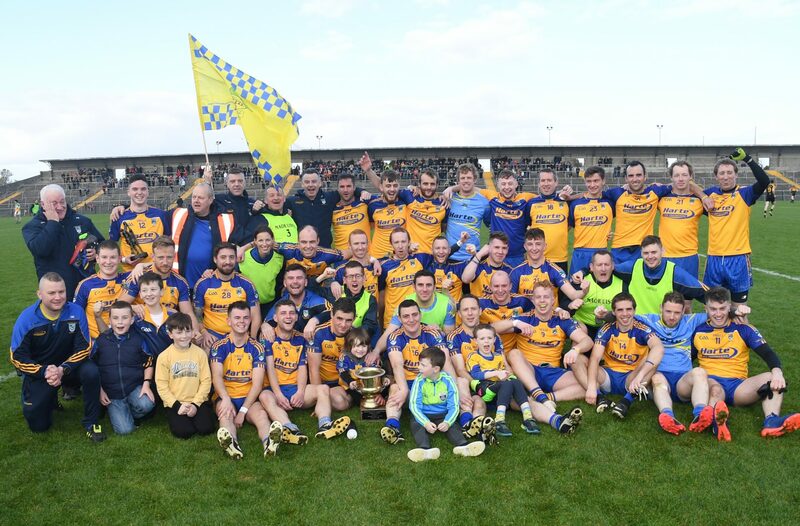 A Tommy Cox point into the wind and then a score from David Nugent turned the tide back in favour of the East Roscommon club, and McHugh knew then that they weren’t going to be denied this year’s Junior A Football Championship crown. Going behind was a huge challenge, mentally more than anything, but Tommy kicked a great point to draw us level. Once David got his score, the confidence levels were pushed right back up and momentum was back on our side again. Earlier on in the championship against Clann too, we were down to them by six or seven points at half time but we knew we had the spirit to fight back from two points,” said the 20-year old attacker. “After the past two years we were not letting this one go. As Niall (Kilcrann) said, we’re not going to have three final losses in a row, not without a huge fight. There’s no doubt that Clann are a very strong team, but there was no way that we were letting go of this one,” he continued. The introduction of Nugent was a real fillip for Kilglass, and after the game manager Niall Kilcrann spoke about the strength of the panel he’s working with, and the way their depth has been tested. “Diarmuid Connellan was injured in a league game against St. Dominic’s, we lost Daniel Cox to a cruciate ligament injury the week before the St. Barry’s game, Cian Diffley snapped his ankle four weeks ago and then Tom Cox broke his leg, and they all would have been starters. But we had guys that have put in the effort and the work all year, and we knew that they could do it on the match day,” he told the Herald. “All year, we needed everyone training, everyone working hard. When I look around at the bench, I see a good mix of youth and experience. We’ve lads that will slot in very well and we’re not afraid to use them,” he revealed. Kilglass Gaels’ run in Connacht last year was a short one as they were comfortably beaten by Ballymote of Sligo, but Kilcrann believes that his charges will be a different team in 2018 because they are coming in on the back of a championship win. “Personally my own take on it is that the team that win the junior championship should go and represent the county, so it probably should have been St. Brigid’s last year, but they’re the rules” said the army man. “It was very hard for our lads last year to come back after the loss. This time we’re going in as Roscommon junior champions and we’ll be taking on Clonbur of Galway in three weeks’ time. That’s a game we’ve to get ready for, and we’ve a league semi-final against Kilbride next weekend and that’s not going to be easy, but we’re in bonus territory now. “We’ve climbed Mount Everest and I don’t know if we can go any further, but we’ll go back to training on Friday. We’re aware that every team that goes forward into Connacht from Roscommon — senior, intermediate or junior — seems to do well and we’ll be looking to keep that record going,” he concluded.